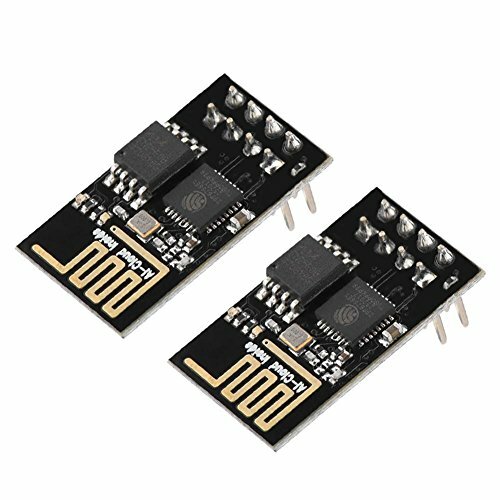 2pcs Upgraded Version ESP8266 ESP-01 Serial WiFi Wireless Transceiver Module with 1M Flash by Wal front at AABX. MPN: Wal front1phiwq9xf5. Hurry! Limited time offer. Offer valid only while supplies last. The ESP8266 WiFi Module is a self contained SOC with integrated TCP/IP protocol stack that can give any microcontroller access to your WiFi network. Power down leakage current of <10uA. A-MPDU & A-MSDU aggregation & 0.4ms guard interval. 1, The ESP8266 Module is not capable of 5-3V logic shifting and will require an external Logic Level Converter. Please do not power it directly from your 5V dev board. 2, This new version of the ESP8266 WiFi Module has increased the flash disk size from 512k to 1MB. 1MB Flash Memory. Wake up and transmit packets in < 2ms. SDIO 1.1 / 2.0, Serial Peripheral Interface, UART. STBC, 1x1 MIMO, 2x1 MIMO. Integrated TR switch, balun, LNA, power amplifier and matching network. Integrated PLLs, regulators, DCXO and power management units.